Natural! This time this is it! The nature trend is more than ever coming back. We were able to verify that “Nature is back for good!”, theme of Stockholm Furniture & Light Fair 2016, stuck to reality. Among top designers, the French Ronan and Erwan Bouroullec have created for Danish editor HAY, the CPH190 desk, leaving a gap between its plate and its desk to let wires and leads circulate freely. Whether you are in a professional “open space” or spending several hours a day in your “home office”, natural materials, combined with access to innovative communications technologies is unavoidable. The pleasure of wooden touch “feeling”, the softness of pastel shades that often accompany it, tends to make every day all the more true, more authentic, more transparent. Let’s not be crushed by the constant flow of dark information that overwhelm us. Let’s “stay the course” while “letting go” what we have no direct action on. At our level, all these little roads of authenticity, put together, will determine our quality of life at work. 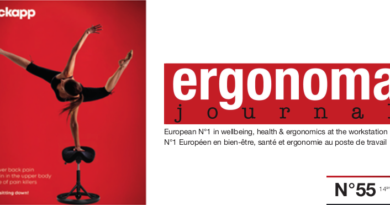 For 11 years, Ergonoma Journal has tried to “pick up” these magical tools, process and places that, every day, participate in your wellness. This spring edition is full of examples. The spring is said to bring renewal. Our work with this issue was to give you hope, modestly we hope to succeed.